A nice diversion from poultry as we anticipate Turkey Day… this recipe is quick, easy and delicious. 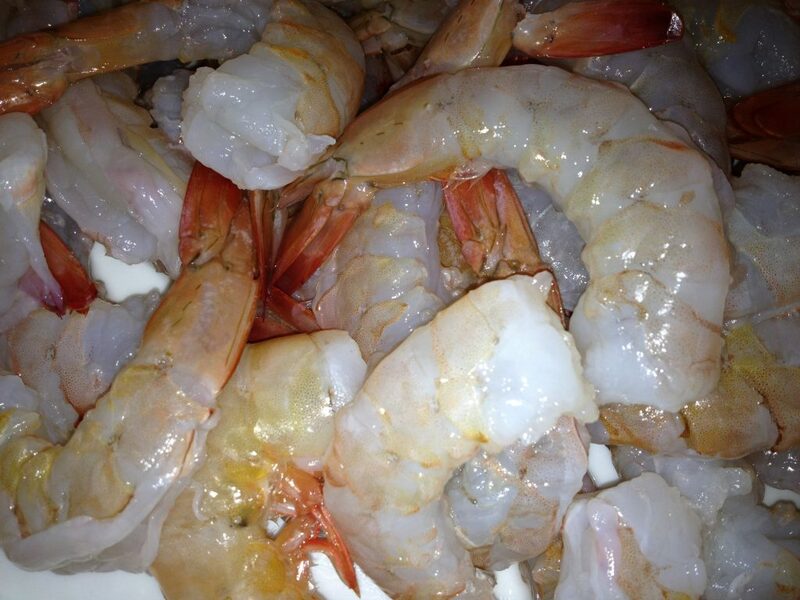 We sear Wagshal’s November Market Special Gulf Shrimp and tossed it over homemade pasta to create this dish. The sweetness of the shrimp with salty Pancetta is palate pleasing perfection!!! Heat a heavy sauté pan on medium high. Add the sliced Pancetta and cook to render its fat. Turn heat down to medium and continue to brown Pancetta until crisp on all sides. Remove pancetta to a resting platter reserving the rendered fat in the sauté pan. In the same sauté pan… up heat to medium high and add enough extra virgin olive oil to cover the bottom. Add the sliced garlic, red pepper flakes and fresh sage sprig. Cook for a minute or so to release the flavors of the sage and spices. Add the shrimp and cook, tossing as needed to heat all sides. As soon as the shrimp turns color… turn off the heat. Remove the sage sprig. Add the crisp Pancetta to the shrimp and toss. Season to taste with sea salt flakes and freshly ground white pepper. Garnish with finely grated Pecorino and chopped flat leaf parsley. 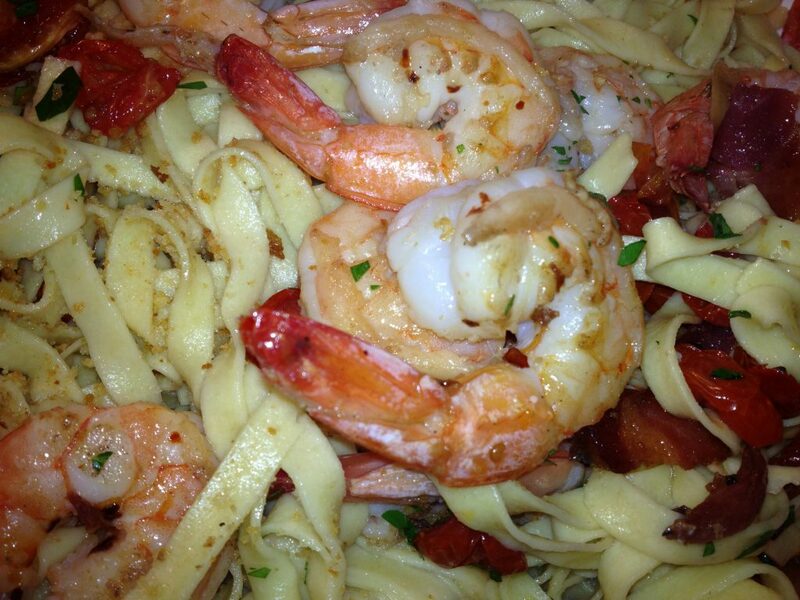 Serve hot over fresh Tagliatelle pasta drizzled with olive oil and tossed with the dregs of the shrimp sauté. In a liquid measuring cup add the eggs, olive oil, and water. Mix well with a fork. Set aside. In a Cuisinart with the steel mixing blade… add the flour and the semolina and pulse a few times. Then, with the Cuisinart on… slowly add the liquid mixture through the feed tube until a soft dough forms pulling away from the sides of the mixing bowl. If the dough is too wet pulse in a little more flour and if it is too dry pour in more water a little at a time. When the dough is just right… knead it on a lightly floured surface for 5+ minutes or until smooth. Wrap it in plastic and let it rest on the counter for a half hour or so. Use right away or refrigerate for a day. You can also freeze it for three months or so. Just remember to remove your dough from the freezer the day before you plan to use it and defrost it in the fridge. Bring it to room temperature before and rest before using.